With close to 3,500 active breweries in the United States, craft beer has become a lucrative business. According to Brewers Association, Idaho craft breweries contributed $318 million to the economy in 2014 and provided 2,750 jobs, at an average salary of $36,275. Anton Bekkerman, an associate professor of economics at Montana State University, recently gave a presentation at the Beeronomics 2015 conference in Seattle, Wash., regarding the effects of excise tax Beer is taxed by barrel of production at varying rates around the country at the discretion of state legislatures. on the brewing industry. 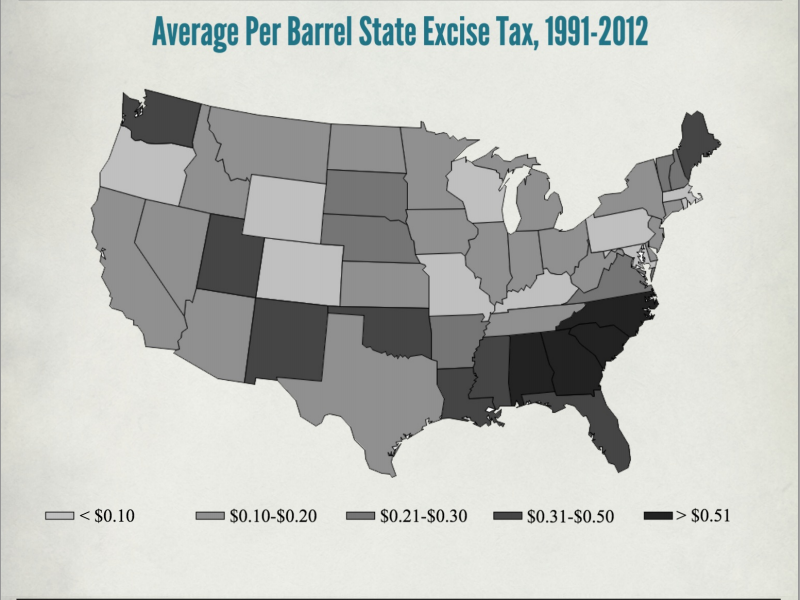 Graph of excise tax rates in the United States, provided by Anton Bekkerman. Hops and barley are two vital ingredients required to make delicious beer. Bekkerman pointed out that legislatures are more likely to keep excise taxes low if it will help support complementary businesses in the state, such as brewing and hop farming. “Except for Washington… the Northwest has the lowest excise taxes,” Bekkerman said. The map above uses data from the Boise Beer Culture website, with permission from owner Bob Hubler. You can view the data and make comments on Google Sheets or issue a pull request for changes on our Github repository. In Idaho, the craft beer bug struck mostly in the last 10 years. Of the 49 operating breweries in the state, 38 of them opened since 2005, and there are plans to open five more in the upcoming year. Mike Francis, founder of Payette Brewing Co. in Boise, believes the recent economic recession encouraged entrepreneurs to explore the craft beer market. “In a way, I think the economy being what it was kind of kickstarted some people into doing something different,” Francis said. Francis launched his company in 2010, and it quickly grew to become the largest brewery in Idaho. Success of microbreweries is not limited to Idaho, as Brewers Association reports 456 new microbreweries opened in 2014, compared to 23 that closed. That makes microbrewing far less likely to fail than the average new business. The massive growth of the microbrew market has raised alarms for the the two giants of the beer industry, Anheuser-Busch InBev (Budweiser, Bud Light, Michelob, Stella Artois, Shocktop…) and MillerCoors (Coors, Miller, Hamms, Keystone, Leinenkugel, Steel Reserve, Blue Moon, Redds…) who together control 70 percent of the domestic beer market. Though craft breweries in the U.S. combined to make up 11 percent of the market in 2014, the multi-nationals have taken measures to slow their growth. For example, Anheuser-Busch Inbev recently purchased 10 Barrel Brewing, one of the most successful craft beer breweries in Oregon and Idaho. Many states use a three-tier system to regulate alcohol sales. In this system, brewers (tier-1) are required to give their beer to distributors (tier-2) to deliver to stores and bars (tier-3). According to Reuters, the U.S. Justice Department is investigating claims that the beer goliaths have adopted practices such as buying out distributors, or offering special discounts to distributors who only deliver their beer. When a company such as Anheuser-Busch InBev controls a distribution network, it gives them power to impede the growth of smaller breweries by distributing exclusively Anheuser-Busch InBev products, making it difficult for microbreweries to expand their client base. Nancy Hoalst Pullen, associate professor of geography at Kennesaw State University and co-editor of “The Geography of Beer: Regions, Environment and Societies,” recently gave a talk at the 2015 Beeronomics conference about the sustainability of the craft beer industry. She has seen some positive effects from craft breweries being bought by large companies. Pullen pointed out that distribution laws are determined at the state level, so they vary greatly across the country. Idaho allows in-state breweries to obtain wholesale licenses so they can sell their product directly to retailers and bars. This allows new breweries to interact more directly with their clientele. “We use a distributer now, but when we opened we delivered all the beer ourselves. 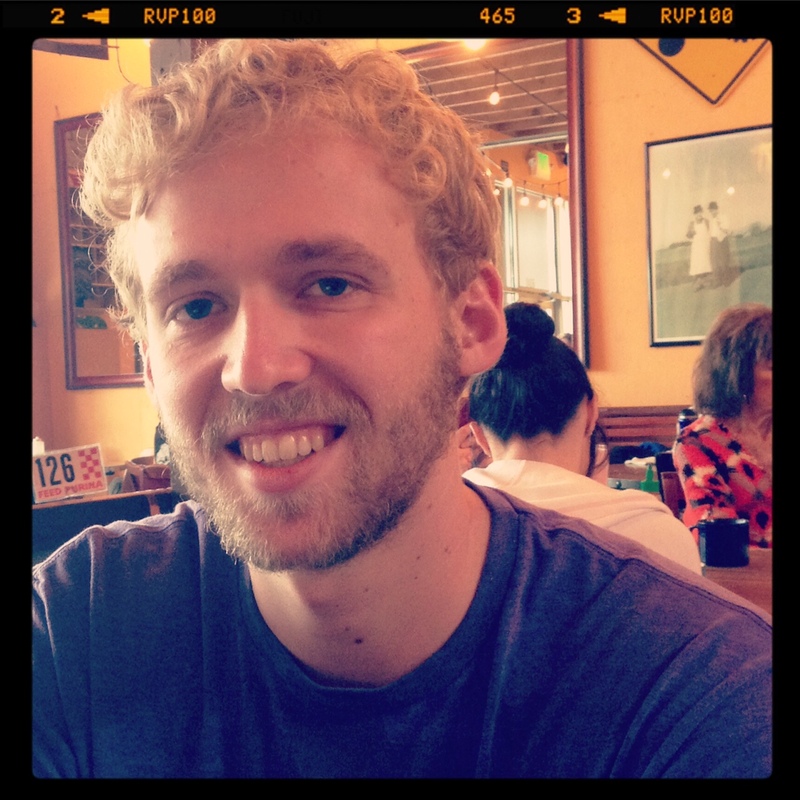 That was always kind of nice,” Francis said of Payette Brewing Co.’s startup years. After decades of largely unimpeded growth and mergers, the Department of Justice sued Anheuser-Busch InBev in 2013 when they attempted to purchase Grupo Modelo, the world’s third largest beer producer and maker of Corona and Negra Modelo. Undeterred, Anheuser-Busch InBev recently placed a $104 billion offer to purchase SABMiller, the larger portion of the MillerCoors conglomerate. If the deal is approved, the resulting company would control roughly one-third of the global beer market. How did Anheuser-Busch InBev and MillerCoors become a duopoly in the United States beer industry? It started with prohibition. Prior to prohibition, in 1916, there were thousands of small breweries across the country. According to the Boise City Department of Arts & History, at least four Boise breweries were owned by German immigrants. A majority of these small brewer were put out of business by the 18th amendment, leaving many successful and established brewers jobless. The breweries that survived prohibition were large companies with industrial grade equipment that could be converted to other tasks. For example, Coors was able to manufacture malted milk to sell to candy companies and Anheuser-Busch produced ice-cream. Both of these companies also sold non-alcoholic beer. When prohibition ended in 1933, the once thriving and diverse brewing culture in the United States was reduced to a handful of large breweries that were quick to capitalize on the open market space. Facing competition from less than 200 breweries, Coors and Anheuser-Busch dominated the American market with German style lagers, whose features include light color, low alcohol content and an unobtrusive taste. This beer was designed to be sold to as many customers as possible; therefore it was cheap and easy to drink. By 1979, the large brewing tycoons had bullied most of their competition out of business, leaving only 44 operating breweries in the country. In the 80s, however, microbreweries began to re-emerge, helped in large part when congress passed a bill that allowed citizens to produce their own homebrew for personal consumption. Since that time, the number of breweries in the U.S. has risen to nearly 3,500, with more opening every year. “The growth of the craft brewing industry has been phenomenal. It’s gotten to the point beer production in the U.S. overall is declining, but the market share from craft brewers is increasing,” said Mark W. Patterson, a professor of geography at Kennesaw State University who co-edited “The Geography of Beer: Regions, Environment and Societies” with Pullen and also spoke at Beeronomics 2015. 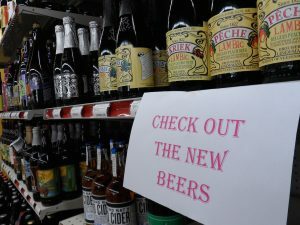 “So what that means is people are drinking more craft beer, and people are drinking less macro brews,” Patterson added. The craft beer revolution can largely be attributed to consumer desire for variety. Beer enthusiasts wanted more flavor, more variety and more choices than the big brewers could offer. Beer has been a part of human culture for thousands of years. It has a rich history, full of various flavors and brewing techniques, but in the fallout of prohibition American consumers were largely limited to light, German-style lagers. When a few dedicated homebrewers in the 70s and 80s began to experiment, pushing boundaries and reviving an old American pastime that had long been forgotten, they found more than just great beer. They discovered an excited community of like-minded individuals who were eager to share a pint and a conversation. Whatever the appeal, craft breweries and brewpubs create a welcome environment for beer enthusiasts to convene and connect over their love for a great brew. “The beer industry is super fun,” said Francis, of Payette Brewing. “You have a product that people like, and have a good time when they drink it. At its heart, that’s what the craft beer revolution is all about.